RCB1061-2U provides a simple, low cost solution to enable you to extend your cabinet's vertical mounting rails inward or outward for your rack equipment. 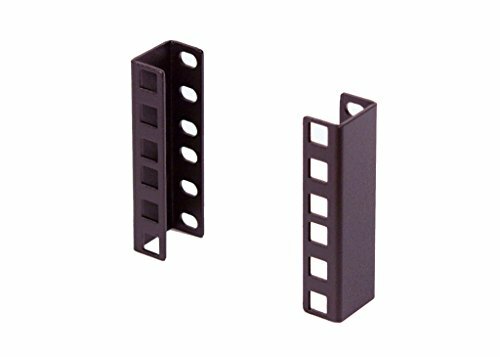 RCB1061-2U is an U shaped extension bracket for a standard 19" or 23" rack cabinet. It allows you to extend a section of the cabinet mounting rails to accommodate your rack equipment. By attaching it to front of the cabinet mounting rail, you can push your equipment outward by 1.1 inch. Usually you need to push your equipment outward due to width of your equipment is creating interference with your existing cabinet which has a narrower opening at front. By attach it to back of the cabinet mount rail, you can create an opening slot at front for additional cable accessing. Fits into any standard EIA-310 19" & 23" 2 Post or 4 Post racks. Specially designed for extend your rackmount point inward or outward by 1.1"
Manufacturer: Industrial Automation and Enclosures Inc. Publisher: Industrial Automation and Enclosures Inc. Studio: Industrial Automation and Enclosures Inc. If you have any questions about this product by IAENCLOSURES, contact us by completing and submitting the form below. If you are looking for a specif part number, please include it with your message.